Can ‘Blue Forests’ Mitigate Climate Change? YEOSU, South Korea, May 21 2012 (IPS) – Fifty-five percent of global atmospheric carbon captured by living organisms happens in the ocean. Between 50-71 percent of this is captured by the ocean’s vegetated “blue carbon” habitats, which cover less than 0.5 percent of the seabed, according to a 2009 United Nations Environment Programme (UNEP) report entitled ‘Blue Carbon – The role of healthy oceans in binding carbon,’ one of the first documents to demystify the term. These recent discoveries – of the efficiency of ocean vegetation in mitigating greenhouse gases and ocean ecosystems’ ability to store atmospheric carbon dioxide for millennia – has sent scientists running to probe the potential role of ‘blue forest’s in global efforts to lessen climate change. 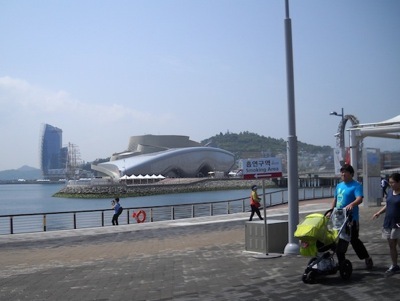 An international symposium on the effects of climate change on the world’s oceans, at the Yeosu Expo 2012 being held here from May 12-Aug. 12 under the theme ‘Living Oceans and Coasts’, brought together scientists and researchers to discuss the carbon management of blue forests. “Carbon stored and taken out of the atmosphere by coastal ecosystems such as mangroves, seagrass and salt marsh is called blue carbon,” explained Nairobi-based Gabriel Grimsditch of the UNEP. “Blue carbon is important because it allows investment in protection of coastal ecosystems. These ecosystems are important for more than just carbon sequestration and storage – they provide food through fish and protect coastal populations from storms and tsunamis,” he added. In a paper presented at the symposium, ‘Vegetated Coastal Habitats as Intense Carbon Sinks: Understanding and Using Blue Carbon Strategies’, Nuria Marba Bordalba, a scientific researcher at Spain’s Mediterranean Institute of Advanced Studies, claimed that there is more carbon stored in the soils of vegetated marine habitats than the scientific community had hitherto accounted for. An important aspect of blue carbon is that most of it is found in the soil beneath the ecosystems, not in the biomass above ground. Carbon can be stored for millennia due to sea level fluctuation, as opposed to terrestrial forests that reach the carbon saturation point earlier. But there are risks. The flip side to blue carbon is that if these ecosystems are degraded or destroyed, the huge amount of stored carbon – sometimes accumulated over millions of years – is released into the atmosphere as carbon dioxide due to oxidation of biomass and of the organic soil in which carbon may have been stored. In fact, some key questions on the table at the symposium were: how vulnerable are coastal carbon sinks to climate change habitat degradation? And, if the habitat is destroyed, how do carbon stocks react? “The rate of carbon emission is particularly high in the decade immediately after disturbance but continues as long as oxidation occurs,” Grimsditch told IPS. “When a wetland is drained, carbon is released, first slowly, then (at an) accelerated pace,” said San Francisco-based Stephen Crooks, co-chair of the International Blue Carbon Science Working Group. “There is now a growing realisation that we will not be able to conserve the earth’s biological diversity through the protection of critical areas alone,” said Gail Chmura, associate professor at the Canadian McGill University’s Department of Geography. The East Asian Seas region of the world has lost 70 percent of its mangrove cover in the last 70 years. A recent publication, ‘From Ridge to Reef’, by the Global Environment Facility (GEF) warned that if this pattern continues the region will lose all its mangroves by 2030. This would be a disastrous scenario, since the region’s coast is comprised of six large marine ecosystems and supports the livelihoods of 1.5 billion people. “On the global scale, mangrove areas are becoming smaller or fragmented and their long-term survival is at great risk. In 1950, mainland China had 50,000 hectares of mangroves. By 2001, it was down to 22,700 hectares – a 50 percent loss,” Guanghui Lin, professor of ecology at the Centre for Earth System Science in Beijing’s Tsinghua University, told IPS. Researchers currently estimate loss of mangroves, seagrass beds and salt marshes at between 0.7 to two percent a year, a decline driven largely by human activities such as conversion, coastal development and over harvesting. “Ecological restoration is a critical tool for biodiversity conservation and sustainable development,” Chmura stressed. During the last three decades China has established 34 natural mangrove conservation areas, which account for 80 percent of the total existing mangrove areas on the mainland, according to Lin. “One of the replicable regeneration policies is a mandatory funding from the real estate sector for mangrove regeneration,” Lin said. “The cost of seagrass restoration may be fully recovered by the total carbon dioxide captured in 50 years in societies with a carbon tax in place,” Bordalba suggested. “Seaweed production as a climate change mitigation and adaption measure (also) holds great promise because it will (contribute to) global food, fodder fuel and pharmaceutical requirements,” said Ik Kyo Chung from the oceanography department of the Pusan National University of South Korea. While acknowledging the considerable uncertainty surrounding estimates and a lack of concrete data, the UNEP report suggests that blue forests sequester between 114 and 328 teragrammes of carbon per year. “Socialist countries in South America like Venezuela or Cuba are skeptical of blue carbon. They are often opposed to market-based solutions to climate change,” said Grimsditch. Mexico, Senegal and Bangladesh are already trying out blue carbon sequestration through demonstration projects. Senegal is using mangroves for carbon credits and REDD+, something the UNEP is pushing in other countries’ policies too. UNEP and GEF with Indonesia have initiated a Blue Forests Project, which seeks to standardise methodologies for carbon accounting and ecosystems valuation. “We also need to better understand the economics of blue carbon, and whether it is possible to pay for ecosystem management through carbon credits,” said Grimsditch.